Very Good. 0141035021 ALL BOOKS SHIPPED WITHIN 1 DAY OF PURCHASE! Good. 024113997X ALL BOOKS SHIPPED WITHIN 1 DAY OF PURCHASE! I hated this book, and so did my Writers Reading Fiction classmates and professor. We couldn't even get through the whole thing due to boredom. I hear that many praise Zadie Smith for her first novel, but I am not one of those fans! In July 2006, Time magazine asked, "Who is th voice of this generation?" and conceited that Zadie Smith would likely be "the consensus number one seed." For the first time in a long time, I find myself NOT rooting for the underdog. 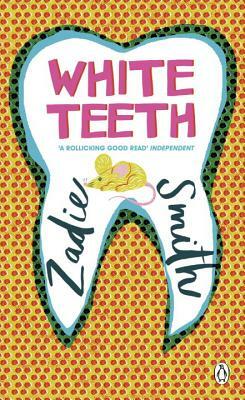 Having picked up Smith's debut, "White Teeth," for no reason other than her reputation, I found it to be a radiant example of all that literature could aspire to. Its 448 pages paint so many vivid character portraits, I found myself wondering several times in reading it, who exactly the book was about. By its conclusion, however, the answer was quite clear: it is a book at once about each of us and all of us. A story of several generations of three different families hailing from very different pasts and coursing along a tangled web of intersected presents and futures, Smith eloquently chronicles their trials of being slaves to the many masters our society demands. Cultural, political, personal, familial, national, sexual, intellectual, spirtual... it's hard to think of one she failed to address. What the book is most about, though, is the absurdly inevidable conflicts that arise from each of us serving each of them in the way we each feel is most appropriate. Whether or not she is truly the number one seed, I will fanatically root for Zadie Smith to long be known and remembered as The Voice of this Generation, and hope we share a wisdom such that that voice be heard. ----- Easily the best book I've read in a long while.